The Search Tool allows users to search for addresses and other map features. In the above image, the search tool has been configured to search on addresses. The user has searched for hospita and results are shown in the top-left of the screen. 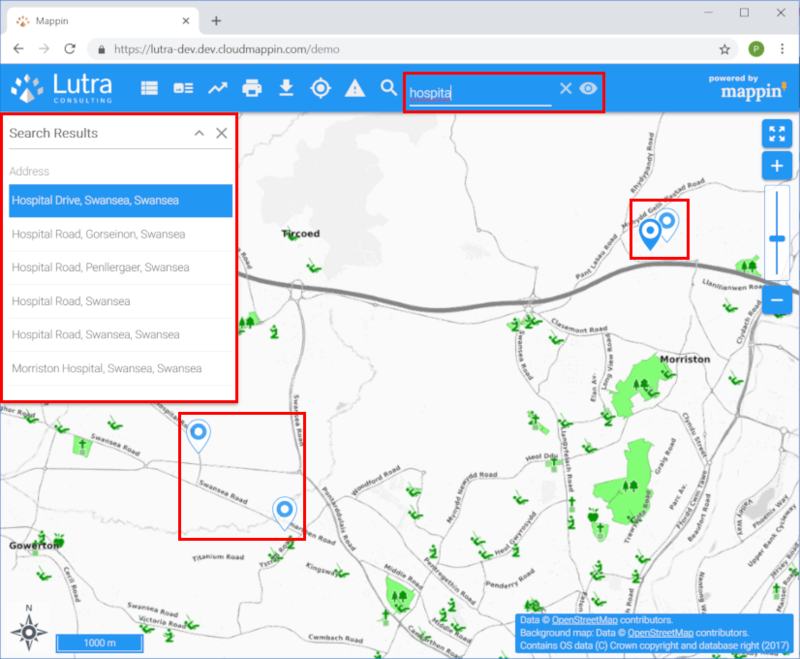 The same 6 results are shown as blue markers on the map and the map will automatically zoom to the extent of search result markers as the user types their query. Hovering over a search result will highlight the row as well as the corresponding marker on the map. Clicking on a result zooms the map to the selected result and opens the Feature Info panel. The user can return back to the list of results by clicking the blue back arrow. Search results can be cleared with the x and the Search Results panel (if closed) can be re-opened with the eye. The search tool has the following settings. If Mappin cannot zoom to the extent of all search results for some reason (for example if the maximum zoom settings defined do not allow this) then this zoom level will be used as a fall-back. The Search Tool is designed to search multiple tables / layers and not just address data. This setting allows additional search columns to be defined. In the example above, you can see that the Name field from the Hospitals layer has also been configured. 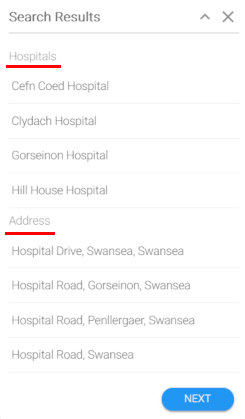 Notice how results now include both addresses and hospitals whose name matches the search. There are some other configuration options related to the Search Tool. In the examples shown so far, the value of the column searched upon has been returned in the tabular search results. It is also possible to include other attribute data in search results, not just the attribute data that we’re searching on. 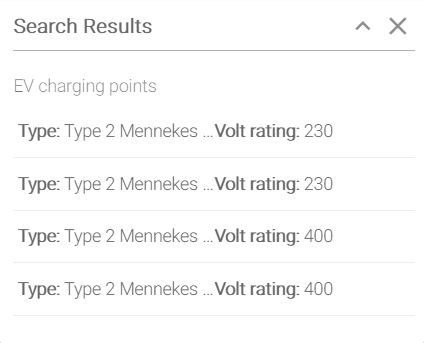 Here the user has searched for mennekes - a type of electric vehicle charging cable. 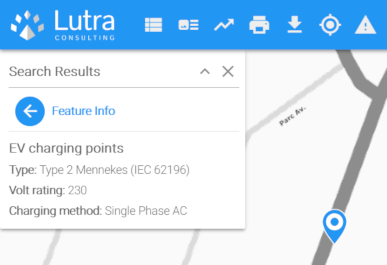 4 electric vehicle charging points are found but the Search Tool has also been configured to show the values of the Volt rating column within the results. Users can now see which are rated 230v and which are rated 400v.